When Sam Raimi’s Spider-Man hit theaters in May of 2002, movies based on comic books weren’t the dominating cultural force that they’ve since become. Batman had been dormant in live-action, big-screen form since 1997’s disastrously campy Batman & Robin. Superman hadn’t flown into multiplexes since the ’80s. Iron Man, Thor, The Hulk, Ghost Rider, Captain America: all in the future. Only the X-Men franchise was active back then, and there was no particular reason to think that it would go on to inspire multiple prequels and Wolverine spinoffs. Spider-Man became the first movie to gross $100 million during its opening weekend, and its success surely led to the glut of superhero movies we’re now experiencing, but it didn’t feel inevitable at the moment it appeared. It felt anomalous. Looking back at Spider-Man now, people tend to cackle at its cheesy digital effects, which were none too impressive at the time and look almost antediluvian today, like something that escaped from a defunct video-game system. 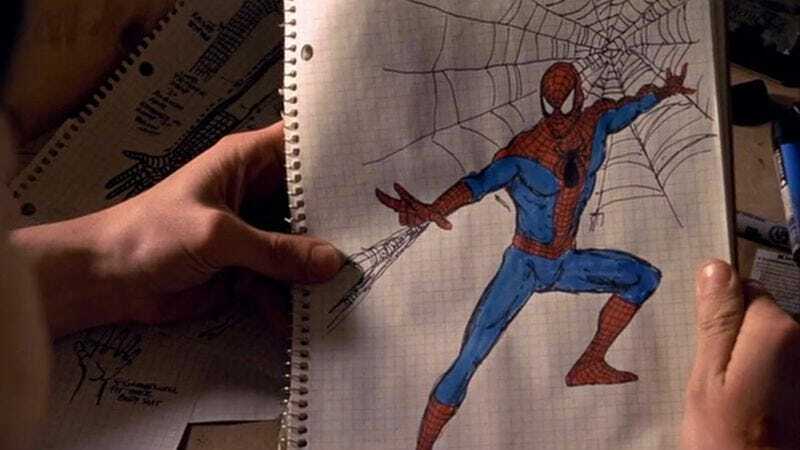 (The webslinging was much improved in Spider-Man 2, which is one reason why that film is remembered more fondly.) Thing is, though, nobody really cared about the action sequences, even at the time. What Spider-Man offered, more than any comic-book movie before or since, was a close approximation of its source material’s unique tone. Raimi and screenwriter David Koepp aren’t afraid to be earnest, even corny; the film is technically set in the present (“and Macy Gray as herself”), but its sensibility seems entirely formed by the values of the ’50s and early ’60s. Take a look, for example, at the first hint of romance between Peter Parker (Tobey Maguire) and Mary Jane Watson (Kirsten Dunst), who live next door to each other somewhere in Queens. I’m guessing this scene was shot on location—if they built a set, somebody did a superb job of creating the illusion of an entire block of houses behind Mary Jane. Either way, the cramped, privacy-free shabbiness of these nominal backyards is something that’s rarely seen in Hollywood movies, which tend to depict wealth, middle-class suburban comfort, or extreme poverty. It’s one thing for Mary Jane to be the girl next door; it’s another thing for her to live practically in his own backyard. As the dialogue makes clear, Peter, who’s just discovering his newly acquired, post-bite superpowers, beat up school bully Flash Thompson earlier that day, impressing Mary Jane mightily. The layout of their respective houses here makes it abundantly clear that she sees him every day, but this appears to be the first really significant conversation they’ve ever had. “You know, you’re taller than you look,” she tells him toward the end, and Raimi’s camera pivots slightly to follow her as she takes a couple of small steps to the right, signifying her change in perspective. Admittedly, that line is cheesy. In another context—an adult romance, say, “based on the book by Nicholas Sparks”—it’d be more apt to provoke laughter than swoons. By this time, though, Spider-Man has done such a thorough job of establishing an anachronistic feel to its world that it’s easy to accept such sentiment at face value. A lot of the credit goes to Tobey Maguire, who resists the temptation to make Peter even remotely cool or smooth. Spider-Man himself is a smart aleck par excellence (much more so in the original comics than in any of the films, as it’s tough to pull off masked wisecracks with actual sound rather than word balloons), but Peter Parker drips sincerity, and comes off as a hugely appealing throwback as a result. When Mary Jane reminds him that she played Cinderella in the first grade, his reply is just “Even so,” but Maguire speaks that simple phrase with so much heartfelt conviction that it’s not hard to understand why her heart melts. Andrew Garfield’s Peter, by contrast, comes across as much more of a regular guy, likable but nothing special. The scene ends with someone—Flash, I think, though he’s too far away for me to be sure—showing up to take Mary Jane for a ride in his brand-new hot rod. This leads to one of Raimi’s signature montages, as Peter, convinced that he needs a sweet ride of his own to regain M.J.’s attention, flips through the want ads looking for deals, then stumbles, hilariously, onto an ad promising to pay $3,000 to anyone who lasts three minutes with a wrestler. (The progression down the final page—each used car costing slightly less than the one above it, culminating in the ad that will solve the problem—is classic Raimi, reminiscent of the rapidly discounted price of hula hoops in the montage he created for The Hudsucker Proxy.) What’s interesting about this montage is that it’s a specifically cinematic device with no real analogue in comic books, yet it seems faithful to Marvel, somehow. Ang Lee’s efforts to create individual panels in 2003’s Hulk were more technically accurate, but Raimi’s dissolves and superimpositions do a better job of translating what reading a comic book feels like. Also, it’s fun. Captain America: The First Avenger was widely praised for similarly going retro, but for my taste it took the idea a bit too far, creating a superhero who’s not just square but downright dull. Plus, that film is actually set in the past, at least until the last few minutes, which sort of dilutes any strangeness. (I confess that I haven’t yet seen The Winter Soldier, which may well make Cap more interesting, or at least productively complicate his stolid nature.) Spider-Man never forgets to laugh at itself, even as it takes its characters emotions very seriously. “NEEDS MORE COLOR,” Peter scrawls during the montage, as he designs his costume; it’s one of the film’s best jokes that his final draft looks exactly like Marvel’s Spider-Man, but the costume he wears to the wrestling gig looks like the Spider-Man costume a four-year-old might put together 10 minutes before heading out to trick-or-treat. There’s a lot of trial and error in this film, which at its heart is a tale of adolescence rather than some inane battle between good and evil. That’s reflected in the sweet simplicity at its core.